Milk makes the most tender chicken and delicious gravy. Milk Braised Chicken Thighs are beyond fork tender and packed with delicious flavor. Did you know that June is #NationalDairyMonth? I’m not sure if you’re seeing more milk ads in your area, but I sure am. I pay attention to them more after learning all about dairy and winning an awesome “Got Milk?” shirt from the Florida Dairy Council. I love that thing! It’s so comfy! Anyway, this week is #dairyweek and a group of awesome bloggers have gotten together and decided to share some our delicious dairy creations. We’re not just talking milk here, people! Cabot sent most of us some amazing cheese to cook with. I say most of us because there were some late to the party and didn’t sign up in time to receive some. However, Cabot is so amazing they’re buying and cooking with some anyway. But I’ve touted my love for Cabot on more than one occasion. I used to eat it before you could get it your local store. Yup! I’m a legacy Cabot lover!! And I say that with pride because their cheese are AH-mazing. Okay. Back to this post and Nation Dairy Month. I’ve tried a few versions of this recipe. Most of them in the slow cooker. While that seemed like a good idea, it wasn’t really. If you’re not home to turn it off or time it just right it’s dry. The chicken just gets dry. So, I thought I’d change it up! This isn’t the first time I’ve published a recipe for meat braised in milk. I did a pork roast with a different type of braising method earlier. That was FABUTASTIC! Everything about that recipe was delicious. The pork, the gravy, the mashed potatoes. The whole meal was just drool worthy. And that’s how this one turned out, too!! I used thighs because they’re a bit more forgiving and usually tender and juice no matter what. I knew a breast might just be too dry if I didn’t monitor it and I really didn’t want to have to do that. Besides, I’m really loving thighs lately. I always thought of myself as a white meat girl, but not so much lately. I did remove the skins because, well, fat. The hubs still has that issue and we’re trying to keep our meals low in fat to help with that. And yet, he’s on a statin already. It’s just genetics, I think. And part life style, I’m sure. So, I remove the skins and the excess fat when we’re cooking our meats to help him live longer. See what I mean? How delicious does that look?!? I want to lick my screen but I know it just won’t taste as good as that. Those herbs and spices, the milk gravy; it all makes for one killer tender piece of chicken thigh. I think have some left over… I see lunch tomorrow!! Now, a word about the braising liquid. DO NOT use it all for gravy. I scooped about 2 cups out for the hubs use in the mashed potatoes. BEST.POTATOES.EVER! They had delicious chicken and herb flavor to really bring out the flavor of the chicken and gravy. Tied everything in nicely. Heat a large Dutch oven coated with cooking spray over high heat. Sprinkle the thighs with the garlic salt, black pepper, and poultry seasoning. Brown the thighs on all sides. Sprinkle the sage leaves over the chicken and slowly add the milk. Reduce the heat to medium, cover, and simmer 20 to 30 minutes or until the chicken is cooked through and no longer pink. The braising liquid makes a delicious gravy or great additional to mashed potatoes instead of your usual milk so don't throw it out! 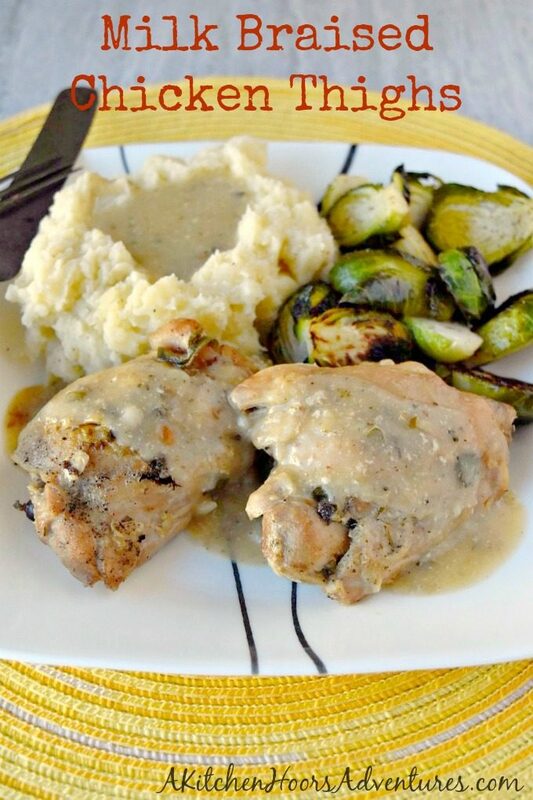 Looks delicious – did you use bone in or boneless chicken thighs? These are bone in, but you could use boneless if you’d like. That looks like such an amazing dinner! I am literally drooling over that yummy chicken! Thank you! It definitely was drool worthy. This chicken sounds like serious comfort food and the whole meal looks so delicious! Thank you! It was definitely comforting and one that I’ll be making again. Your description of this meal totally has my mouth watering! How delicious and chicken that makes it’s own gravy AND perfect addition to the taters? YUM! Sold!!! Thank you! The milk truly does make for delicious potatoes and gravy. Sounds amazing, i have to try it! Thanks! I hope you enjoy it was much as we did. These look absolutely amazing!! I love the milk braising and can’t wait to try that cheese! I just love all of the creamy deliciousness you have going on here! I’d love to devour everything on that plate and your milk braising guarantees no dry chicken here! For sure, the chicken doesn’t get dry. Well, I guess you could really overcook it, but still. This will be a fabulous family meal. I’ve heard great things about how moist chicken is when cooked in milk. You’ve made me a believer. It truly is moist and delicious! And that gravy is to die for. I’ve seen milk-braising for other meats (and have had a lovely version in Spain) but don’t think I’ve ever had chicken- one for the list! It’s SO good! And that gravy is divine. I hope you enjoy it. I love making chicken thighs and your recipe sounds perfect. Thank you! They’re delicious, aren’t they? Looks like pure delicious comfort food right here! This looks so dang good! I love the idea of using some of the braising liquid in the potatoes too. I am a mashed potato fan anyway, but that really has me licking my lips just thinking about it! It was a genius idea, if I do say so. Made the potatoes SUPER tasty! Calcium, vitamin D and vitamin A. These chicken thighs look like the perfect way to get these included in my diet! We love using chicken thighs versus chicken breasts. They are so much juicier. This looks like a recipe that my family would love. The gravy is so creamy looking! perfect dinner. 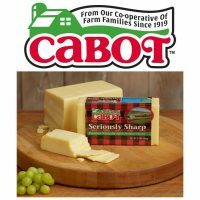 By the way, we only use Cabot cheese! They are the best. I’m loving thighs more and more. The milk does make the creamiest gravy in this recipe and it’s oh so good. I love this- it sort of reminds me of Maryland fried chicken, only healthier! Thank you! The only Maryland fried chicken I had was fried at an Amish market. It was pretty good.